Would you encourage your loved one to ride their bicycle here? This is currently the condition on Pine St, an important walk/bike transportation corridor. It’s unpleasant for people walking and downright dangerous for people biking. But it doesn’t have to be this way. Central Seattle Greenways has set out to make some changes. 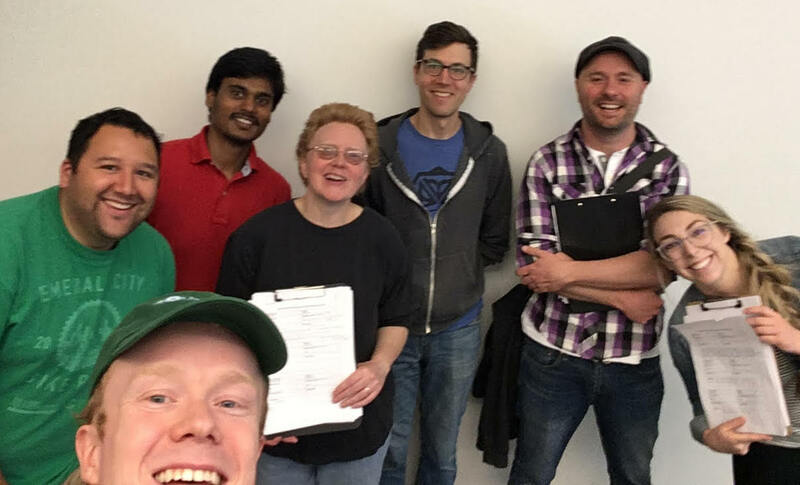 They teamed up with Capitol Hill Housing’s Renter’s Initiative, the Capitol Hill Community Council, and Cascade Bicycle Club and over three days in Spring 2017, approximately 20 volunteers and staff conducted door-to-door business engagement along the Pike/Pine corridor. 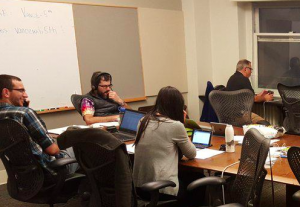 Team members spoke with people in 59 (!) businesses about how people get to their establishment, what traffic safety issues they see on the streets, and what kind of street improvements they would be interested in seeing. The good news is that business people really do care about safe streets. 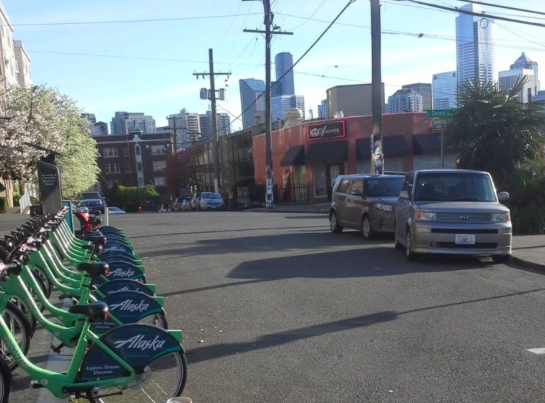 The conversations went well and the volunteer teams collected valuable information, made new contacts, and helped start a conversation about how to improve the safety of Pike/Pine for people walking and biking to local businesses. This fall the team is planning to continue advocating for safer crosswalks bike lanes on the Pike/Pine corridor. Would you like to get involved? Stay tuned! Distribute silhouettes to put up locally. Hear from first responders and from families whose loved ones were killed in Seattle traffic. Central/Capitol Hill noon Victrola Coffee Roasters 310 E. Pike St. The City Hall event is open to the public and will recognize attendees from Seattle Fire, Seattle King County Public Health Department, Washington Traffic Safety Commission, National Highway Traffic Safety Administration as well as families of the victims who have died in traffic in Seattle. To honor those who have lost their lives to traffic violence on Seattle’s streets, we will be putting up silhouettes all across the city. We will meet for a Citywide Memorial on Thursday November 17 at 12:00 noon, in the lobby of City Hall. 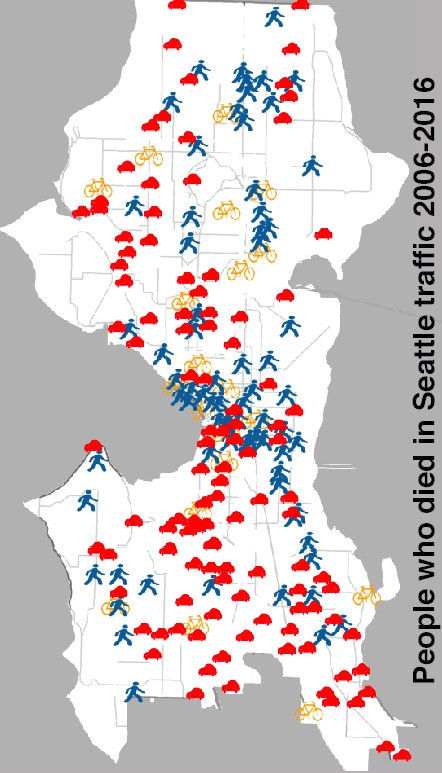 We will distribute 240 silhouettes representing people who have died in Seattle on our streets in traffic in the past 10 years, and highlight the need for safe streets in our city. On Sunday, November 20, families and groups around Seattle will install all of the silhouettes at local events. This a difficult time for many of us right now. World Day of Remembrance, while not a joyous event, is something that we can come together on, as well as to help raise awareness among our friends and neighbors. World Day of Remembrance is not a political event, but it is the kind of community building and coming together process that will help us keep America great. Thank you for joining us. Thank you to the staff at United Reprographics for manufacturing these silhouettes. Designing New Capitol Hill Park, Share Your Ideas! Central Seattle Greenways is partnering with the Capitol Hill Community Council and SDOT to transform an under-used block of road into a new Capitol Hill park! We kicked off the process at the April Community Council meeting, and will be designing the park over the next several weeks, for construction late this summer. Learn more and share your ideas at Central Seattle Greenways website. New Park @Summit between Olive and Denny? Let me tell you a story about one person who reached out to neighbors over the past few years, and with their help – and a little help from Seattle Neighborhood Greenways – built a park, got safer routes to their local school, slowed traffic on one of Seattle’s most dangerous streets, and helped well over one hundred neighbors meet each other for the first time. I’m talking about Janine Blaeloch, founder of Lake City Greenways, who led the effort to develop Olympic Hills Pocket Park, gathered neighbors for crosswalk actions to slow Lake City Way traffic, and helped with the Olympic Hills Safe Routes to School sidewalk project. What is extraordinary is that I could have as easily told you this same story a dozen times and more about Greenways leaders throughout Seattle – Phyllis Porter and Deb Salls leading Rainier Avenue South road rechannelization efforts, Don Brubeck and Deb Vandermar who were instrumental in the road safety and safe intersection efforts along 35th Ave SW, leaders at University and NE Seattle Greenways who visited business owners up and down Roosevelt Way NE and helped to make protected bike lanes on Roosevelt a reality, leaders at Licton Haller and Greenwood-Phinney Greenways who are helping five local school groups plan for their Safe Routes to School priorities. You can tell how much the Dutch care about traffic safety by looking at their school playgrounds. 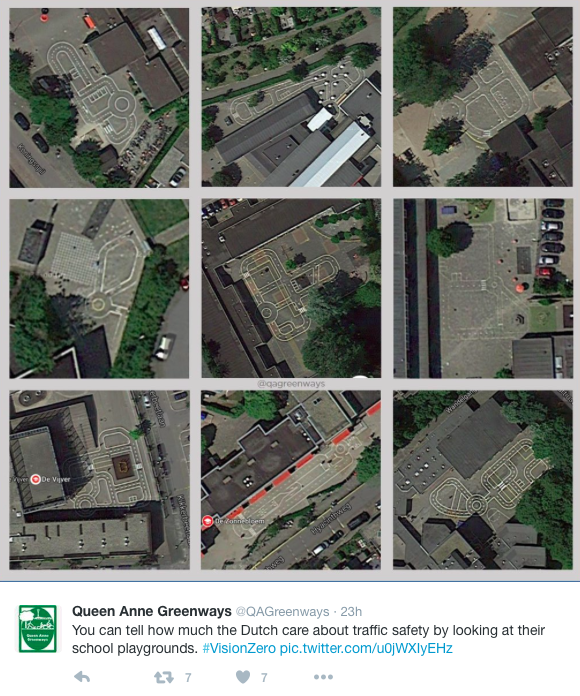 On a recent trip to The Hague in the Netherlands, Queen Anne Greenways leader Mark Ostrow saw a playground painted as a mini Traffic Garden where young children could practice road safety skills. Mark decided to follow up with help from Google Maps to see if many Dutch schools used big expanses of playgrounds to familiarize their children with road safety in a protected environment. Mark found Dutch elementary schools (“basisschool”) paint nearly the entire asphalt surface of their playgrounds with mocked-up road markings, so one can assume they are a common playtime activity and prominent part of the physical education curriculum. Painted asphalt playgrounds would be a terrific complement to a newly launched partnership between Cascade Bike Club, Seattle Department of Transportation, and Seattle Public Schools to offer a three-week walk and bike safety curriculum to every third through fifth grader in Seattle Public Schools starting in the 2016-17 academic year. They wear big 3″ buttons with a young face and a date. They are parents still, even if their beloved child has died. Their eyes are haunted. I have lived through the grief of losing my husband and best friend to cancer. I have gone through the gut-wrenching agony of nursing my teen daughter through lymphoma. I try to have an open heart and my heart breaks every time I face the pain of grieving parents who have lost a child to traffic violence. 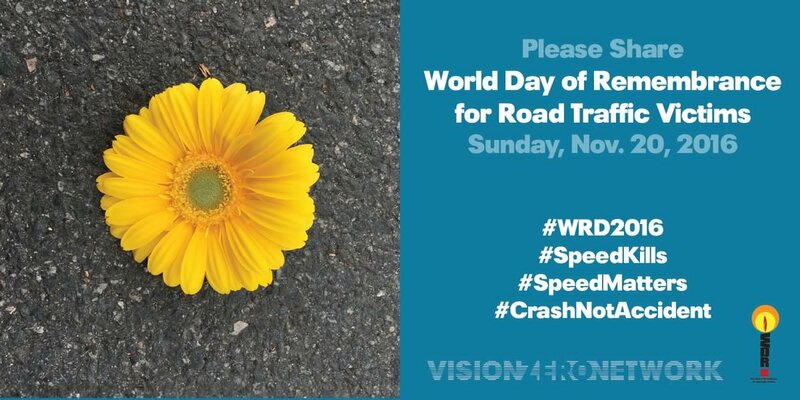 Today, November 15, 2015 is the first day the US has honored the World Day of Remembrance for Road Traffic Victims #WDR2015. I have had the honor of meeting many parents whose children have died by traffic violence or have been injured for life. 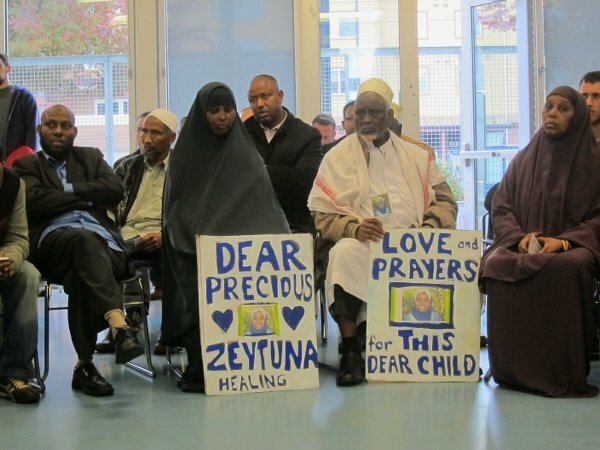 In Seattle I have sat with the parents of Zeytuna Edo, Trevon Crease Holden, Sandhya Khadka, Caleb Shoop, Elias Schulte, and more families of people who were killed or gravely injured by traffic violence. If you care about healthy, safe streets in Seattle, this is the party is for you! Join Seattle Neighborhood Greenways as we celebrate the amazing accomplishments of our volunteers over the past year and look forward to next year. If you come to the party, you’ll be able to vote for the best of the best in categories ranging from the Exemplary Street Experiments to Greenway Champion. That is right, we’re asking you to decide the winners on the night of the party. Beer, food, prizes, awards, a kids craft area with awesome Shirley @NoSpandexReq, and more fun surprises are in store for you at the best holiday party in town. Thank YOU For Moving Seattle! Wow! Your hard work paid off! We passed the Move Seattle Levy with 58% of the vote! Thank you! The future of living in Seattle suddenly seems a lot more hopeful. 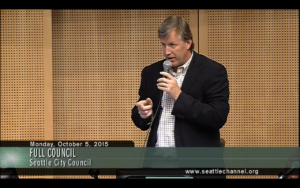 Seattle will be able to repair bridges, repave roads, and replace broken signals and signs. Important as it is to maintain the infrastructure we have, your local action helped to pass a nearly billion dollar transportation levy because you are also ready to transform Seattle streets! Over the next nine years, we now have the funding to build half of the Bicycle Master Plan and build or repair nearly 500 blocks of sidewalks. Of special note, thanks to your efforts to highlight the importance of children being able to safely walk and bike to school, the Mayor has pledged to make safe routes to every school his first priority. Our work as a grassroots advocacy coalition is just beginning. 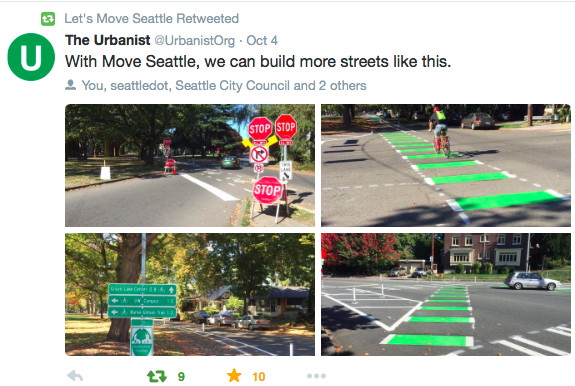 Now comes the fun part when we make sure streets are built to standards that transform Seattle into a leading beacon of safe and healthy streets for all. Once again, you proved the power of neighbors who care. Thank you! 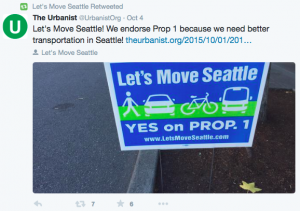 Together we advocated for the most progressive transportation levy in Seattle’s history. Together we made safe routes to school the number one topic of discussion. Together we made thousands of calls, hosted press conferences, placed scores of yard signs, doorbelled across the city, donated, spread the word on our social networks, and waved signs. Together we passed a transformative levy by a strong margin. Together we won funding for safer streets for all. p.s. Save Thursday Dec 3 5:30pm for a volunteer thank you & award celebration #Party4OurStreets in Pioneer Square. RSVP here. 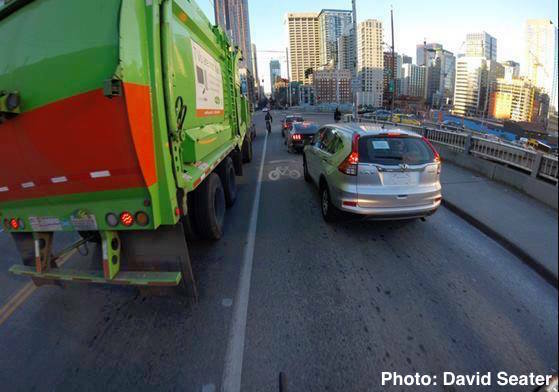 Check out many ways you can pitch in to support safe streets by helping the Move Seattle Levy! Add a “Twibbon” to your Facebook or Twitter profile picture. Place signs in your neighborhood (the best places are in areas where lots of people are going to be going by). Gordon@seattlegreenways.org can get signs to you. Be sure to take a selfie with your sign and use your greenway Twitter to tweet the photo to @letsmoveseattle! 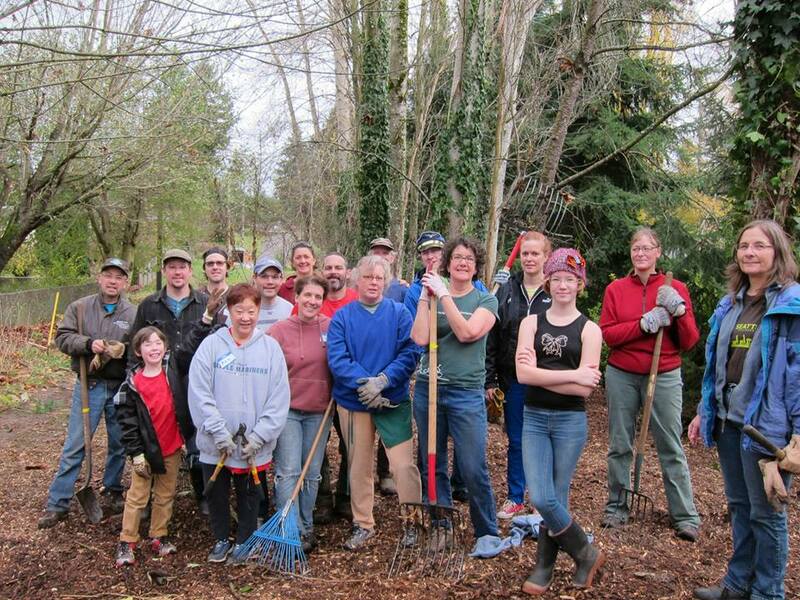 Join Ballard Greenways & Connect Ballard Saturday October 10! Start at 12:00, Saturday Seattle Coffee Works Ballard (2060 NW Market St, Ballard, WA 98107) ending at 2:30. Join Rainier Valley Greenways Saturday October 24th 10am to 2pm at Bike Works Bike Works, 3715 S. Hudson Ave.
Join University Greenways Thursday October 15, from 5:30 to 8:30 at Cafe Allegro (4214 University Way NE, Seattle, WA 98105). They have the upstairs meeting room reserved and we will provide some food. Join Rainier Valley Greenways Tuesday October 20th, at 6:30 PM at Bike Works Bike Works, 3715 S. Hudson Ave.
Stay tuned for a Central Seattle Greenway phone bank being scheduled on Monday. None of these times or opportunities work for you? See more Move Seattle campaign opportunities here. 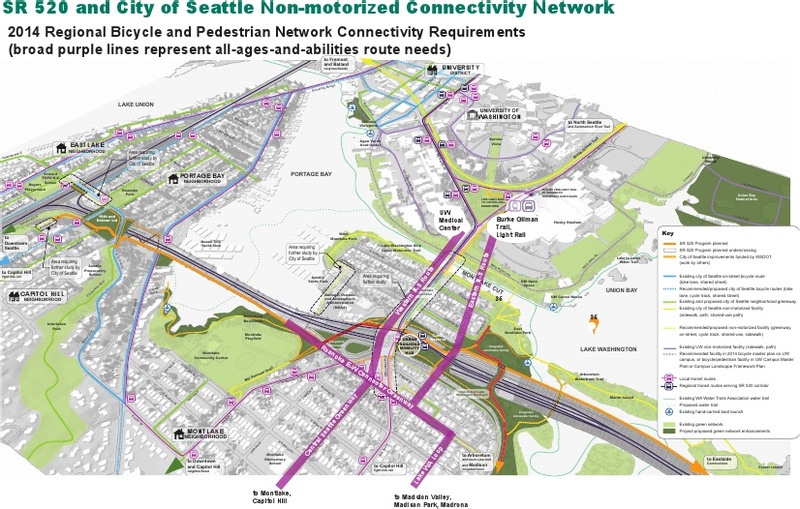 Designing better walking and biking connections as part of the SR-520 project is our 2015 District 3 priority. Exciting news! The new SR-520 interchanges will be easier to walk and bike across. In January of this year we sent a consensus letter detailing what needed to change with the SR-520 interchange design to make it safer to walk and bike across. With this momentum we worked with Councilmember Mike O’Brien to propose amendments to the the resolution addressing these concerns. Thanks to his leadership and support from other councilmembers amendments to address walking across the Montlake Interchange and biking on Montlake Blvd were approved unanimously! 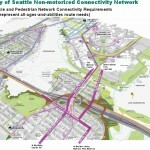 While an amendment to include a neighborhood greenway on the Lake Washington Loop was not put forward, it did raise the profile of project significantly and funds from the Neighborhood Park and Street Fund were allocated to help study the project. These amendments helped strengthen an already excellent resolution, so now we can truly look forward to a project that reconnects instead of further dividing our neighborhoods. Thank you to all to the many people made this victory possible! Specifically we would like to thank Councilmembers Mike O’Brien, Tom Rasmussen, and Kshama Sawant; our local greenway organizers Mike Archambault, Lionel Job, Bob Edmiston, Jerry Fulks, Drew Dresman, Forrest Baum, Brie Gyncild, and Merlin Rainwater; our healthy transportation allies Brock Howell, Kelli Refer, Andrew Austin, Kristi Rennebohm Franz, and the Connect Seattle members who turned out at the hearing. We would also like to thank Andrew Glass-Hasting and Lyle Bicknell for their work making this project work for all people. Thank you.